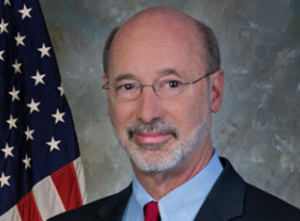 Governor Tom Wolf signed his first pieces of legislation yesterday. Gov. Wolf held a ceremony for the signing of Act 1 (House Bill 152). The legislation extends the application period for survivors of police officers killed in the line of duty to collect death benefits. He was joined by April Waller and Knidia Kea Coleman who have lost loved ones. “It’s hard to imagine the pain each of these women felt, as well as the countless families across the commonwealth who have lost their loved ones, and it should be our job to ease that hurt in any way possible,” Governor Wolf said. The Governor also signed three more minor bills on Wednesday. Meanwhile, the PA Senate confirmed nine of Gov. Wolf’s cabinet nominations. I was layed off permantely on 11/28/2016 and have been trying to validate and confirm my Unemployment Compensation ever since November 29th 2016 and to date have not received any payment. I registered with UC and Job Gateway on the same day. I then received a letter that I was not registered with JG so I registered a second time, same thing happed again and I registered a third time. IT IS IMPOSSIBLE TO REACH UC SINCE THEY DO NOT ANSWER PHONE. I have called UC on 27 different days with ( 6 to eight times a day) and can not get through. I have been able to contac UC when using hot line at JG. I received finalcial determination and was to get my first check the week of 2/5 ( which should have started on 1/22) and that has not happened. I used hot line at JG on 2/9 and was told my payments were being held do to a review of my pension. When I questioned JIM at UC about process for determination and asked for a managing supervisor he told me to shut up!!!!!!!!!!!! The lack of response and difficulty in reaching out to UC is horrible!!! Since no one takes ownership at UC I suspect my comments will go unaddressed. Pennsylvania compensation and lack of response is a disgrace. I want to request an amendment me to MV1301(a). The current motor vehicle transportation policies empower law enforcement offers to tow vehicles. I don’t believe this is necessary when the booting system is this in operation. Towing prevents title holding owners from selling their vehicle(s). Likewise, excessive fees may accrue for unemployed citizens in tough economic times like a recession which a citizens cannot afford. Storage may have to been paid, with proof of insurance and registration before a citizen can use the vehicle for work. Discriminatory towing exists in Philadelphia against citizens with private garages versus those who share common street parking. Thank you!